Those animals who nurse their young are called mammals. The organ that produces the milk is called a mammary gland. In humans, mammary glands are usually called breasts. We present below some pictures of different mammals feeding or nursing their babies. They are very sweet, cute pictures of a precious relationship between mom and baby. The same is true of humans: breastfeeding is about nurturing one's child with the best food possible, at the same time providing comfort and closeness. It is very special and precious. It is NOT about sexual things. Some people mistakenly think that only humans have enlarged mammary glands, or breasts that are protruding. But that is not true. 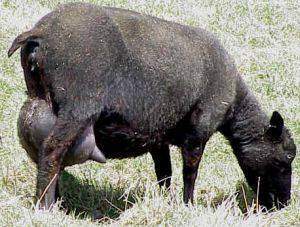 Goats, sheep, and cows udders are their mammary glands - corresponding to the female breasts. 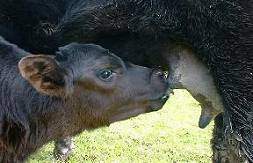 Udder is quite 'enlarged' or visibly big even before the animal starts lactating. 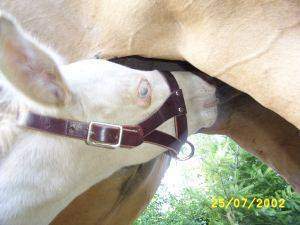 Of course during lactation it is even bigger, and can be huge in modern hormone-treated dairy animals. During lactation, dogs 'breasts' or mammaries can grow in size quite a bit. See the picture above about the wolf dog puppy nursing. 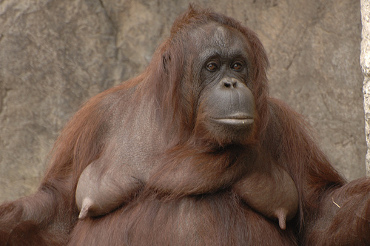 Primates like gorillas and orangutans also have protruding 'breasts' - see the pics below. We present this animal nursing photo gallery so everybody can see what nursing is and how breastfeeding is the same thing in humans. 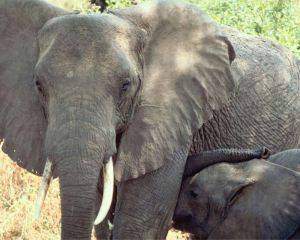 An elephant calf is nursing. A calf few weeks old knows where the milk is. 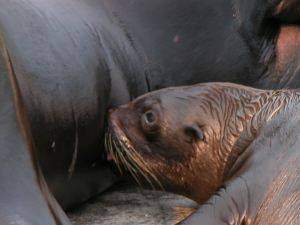 This is a walrus pup getting milk. 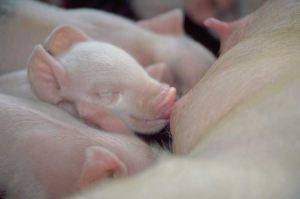 Here you see many piglets nursing. Newborn wolfdog puppy nursing. Notice the mammary gland is definitely enlarged compared to non-lactating dog. Click here to see the first steps of a baby horse after birth. When he gets on his feet, where does he head???? You're right! The SAME is actually the best start for human babies too - and not have the baby separated from the mother to go to some kind of baby nursery. Newborn male calf (bull) nursing. The same bull at 6 months. Mother has experienced "post-partum weight loss". An icelandic ewe nursing a lamb. Udder on a very milky Icelandic ewe. 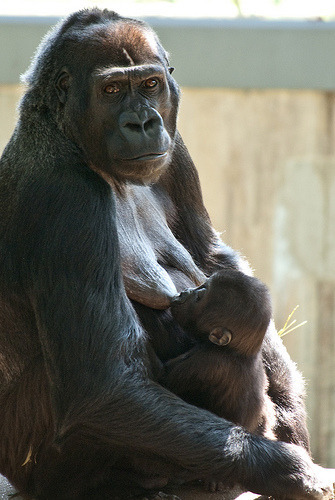 A gorilla mother with baby. 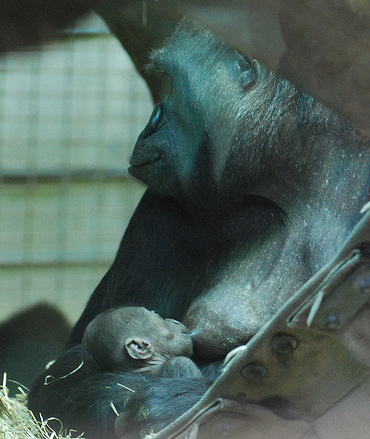 Gorilla babies are weaned around 3-4 years of age. Orangutan mother. Look at her breasts! Orangutans wean the baby around 3-4 years of age but some nurse their young till 6 years or more. A gorilla mother nursing a baby. See the 'breasts'! 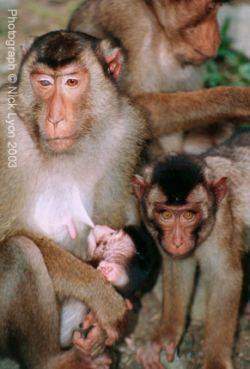 These small monkeys are pigtailed macaques. Aren't those animal nursing pics cute? How much different is it then when you see a nursing mom? It's not. Humans are mammals, too. The purpose of female breast is to produce milk for the offspring. It's still just about nourishment, bonding, and being close.